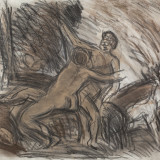 Piano Nobile is delighted to announce Leon Kossoff: A London Life, an exhibition of paintings and drawings by one of Britain’s most acclaimed living artists, curated in partnership with Andrew Dempsey (curator and writer). With a catalogue raisonné of Kossoff’s paintings in preparation, this is an apt moment to consider his oeuvre. The show will bring together masterworks from each period of the artist’s career, demonstrating the unwavering rigour, the nuance and the psychological intensity of his output. The exhibition explores the artist’s working practice and his creative environment. The city of his birth, London has played a central role in his career and many cityscapes will be on display – from Willesden Junction to Christ Church, Spitalfields. Kossoff has spent over six decades working in North London and the show will draw attention to the subtle, often poignant relationship between his creative life and his surroundings. His friends and family have also contributed to his vision and the exhibition will reflect on the relationship between the artist and his models. It will include oil paintings of his brother, Chaim, and his model and friend, Fidelma, long-standing subjects in Kossoff’s work. Together, these landscape and figure paintings will present an irrefutable argument for Leon Kossoff’s place in the canon of modern master painters. A fully-illustrated publication will accompany the exhibition with an introduction by Jackie Wullschlager (chief art critic for The Financial Times) and essays by Andrew Dempsey and Lulu Norman (writer and translator).